The Blade series is reborn with Countervail Technology in an effort to reduce the amount of shock that players receive when striking the ball and mitigate fatigue. 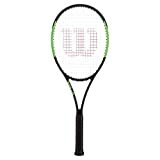 Similar to its predecessor (Blade 98 (16×19)) this racquet is an all-around performer. Slightly more forgiving than the 18×20 because of a more open string pattern, power and control are perfectly blended. Weighing just over 11 ounces strung, the Blade 98 16×19 feels very solid as you come through the ball and absorbs heavy shots at net with ease. On serve the mass in the racquet head is most notable by delivering a crisp and powerful feel that will certainly impress. The Blade 98 16×19 Countervail is a great update to the best selling blade series and demonstrates a commitment by Wilson to improving racquets year after year. Head Size 98 sq. inches / 632 sq. cm. Spring tension calibrator for checking machine accuracy.